This is a guest article from Yield Hunting. The article highlights some top muni closed-end-funds (“CEFs”). If you don’t know, you invest in muni CEFs to generate steady streams of tax-free income and compound it year after year. The non-quantitative benefit of muni CEFs are that natural downside hedge they can offer, especially on the high quality funds (non-high yield). We issue a muni market update every month after the earnings and distribution announcements have been made. We run a model regression to find undervalued muni CEFs and we focus on distribution stability above all else. For more information, please feel free to PM me on the chat. Discounts are much tighter than 3 months ago so we've gone from looking for shorter-term trading opportunities to longer-term "holds"
Fundamental research is again key as we hunt for those funds that are likely to sustain their distribution for the rest of the year. We want to avoid distributions cuts as the rest of this year appears to be a coupon +- return environment. In 2019, municipal bonds have been enjoying their best start to a year since 2006. And we've seen many news headlines recently about the lower tax refunds affecting some filers this tax season. While a lower refund doesn't necessarily mean a higher tax bill, in some cases, individuals are being caught off-guard by what they owe. 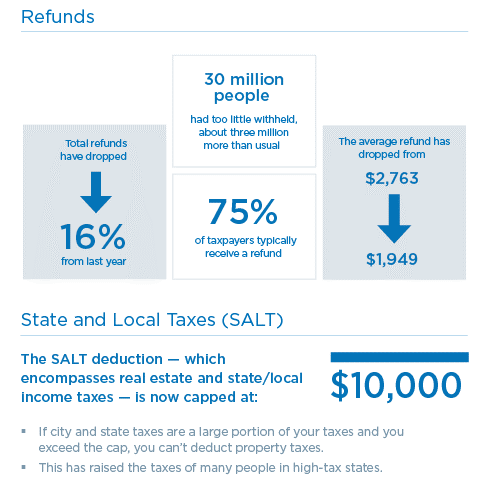 Eaton Vance had a great infographic on the current situation titled "Why is my tax refund smaller this year?" The new SALT cap at $10K is likely to create more demand for muni bonds- something we've discussed already but is likely to gain new visibility as high earners get their tax bills. Stable muni supply compared to prior cycles provides a favorable supply-demand environment. Aging demographics and the risk of higher taxes due to large structural deficits is likely to boost muni demand further. Despite some “flashing orange” macro signals, PIMCO’s economic outlook for 2019 is broadly supportive of the municipal asset class, which has tended to perform well in late-cycle environments. Past periods of rising rates – including in 2018 – have highlighted the sector’s diversification benefits and outperformance relative to mainstream stocks and bonds. Lord Abbett also discussed the steepness of the muni yield curve in a recent report- which contrasts to the treasury yield curve's flatness. Since the start of the year, we've seen a truly amazing move in muni CEFs closing their discounts. Our goal here is dividend stability and good long-term total returns. As such, valuations while not cheap, are not so much of a concern as it would be in the taxable side. Nuveen High Income (NMZ), Mainstay MacKay DefTerm Muni (MMD), and Dreyfus Infrastructure Muni (DMB) are still the top choices for muni exposure in the closed-end fund structure. We wouldn't change anything here. 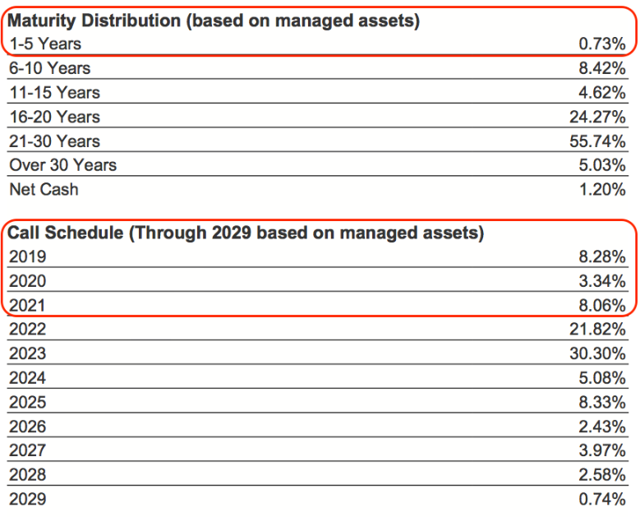 Much of the Blackrock complex looks good (many of the funds are just clones of each other with only small variances). RiverNorth Opportunistic Muni (RMI) is a decent choice today but watch for liquidity and it remains to be seen just where the discount widening "bottom" will be. We also continue to like the high yield MFS funds (CXE)(CMU) as they match NII with the distribution. If they raise, it could really boost the shares. Two new funds came on to our radar, Nuveen AMT-Free Quality Muni (NEA)and Nuveen Quality Muni Income (NAD). Blackrock is firing on all cylinders. 'Top Conviction' choices include: BKN, MQY, and MQT. Blackrock convergence trade opportunities: MHD and MEN. NMZ continues to show very strong fundamentals. While NMZ is not "cheap" anymore, it is still a great hold here given those fundamentals. Unless you have that deep-seeded trader mentality, we don't think selling here makes sense given the lower interest rate regime. You can continue to collect a strong tax-free income stream that is unlikely to be cut in 2019. DMB is the only Dreyfus fund that isn't facing major call exposures and remains a great buy-and-hold type of fund. At a 5.06% yield, and a 8.9% discount, it remains one of the best funds. New financials should be out in about a month. CXE/CMU remain solid choices to allocate capital for tax free income. CMU at a -5.7% discount is close to the 52-wk average and 3 points wider than the 52-wk high. If they were to raise the distribution (remember that payout is more variable), we think the discount would tighten significantly. NEA/NAD: These two funds look like NMZ did a few months ago (i.e. appear to be headed to a similar turnaround in UNII). The trends in the fundamentals are still in the early days and not really visible yet. UNII is still negative but coverage continues to improve and we expect UNII to as well. They won't yield as much as NMZ given they are 89% IG where NMZ is a high yield fund. These are more speculative ideas at the moment. BKN, MQY, MQT: When looking at these funds, our goal is to find the perfect fund [high coverage, high UNII, strong NAV performance, wide discount, favorable call schedule, and not overpriced versus our model]. All three have coverage around 103%-104%, positive and either stable or growing UNII, strong NAV total return, some convergence opportunity left (of about 1-2 points), favorable call schedules, and all three cut last year . These are stable dividend choices. MEN/MHD: These are convergence trade opportunities (although we could make the argument that MEN could be a stable dividend conviction choice as well. We eliminated them temporarily from being a conviction choice since they just cut the distribution and the share price may not have bottomed out just yet. Other factors (coverage, UNII, discount, etc) all look similar to BKN, MQT, and MQY. Even after the cut, MEN yields 5.00% so it's feasible to think that the discount won't widen too much from where it is currently. For now, we will keep it as a convergence trade. BFY, our NY muni pick, remains the best choice and may still have some discount reduction juice left. Although it recently set a new 52 wk high, it is still among the widest within the Blackrock NY cluster. BFY has a solid portfolio and high yield. BQH and BNY are other good choices in that space but their much lower yields make them less attractive. BQH and BNY are other choices in that space but their much lower yields are a negative for us. MHF remains our top pick for the non-levered muni space. NAV is moving higher nicely and discount widening. PIMCO funds remain significantly overvalued. We would avoid most of the Invesco munis except OIA and VPV. However, OIA remains expensive (sell flag is flipped). BTA hit its sell target. Swapping to one of the other Blackrock funds mentioned above makes sense. This is another fund-of-funds from RiverNorth, a closed-end fund investment manager out of Chicago. They already have RiverNorth Opportunistic Income (RIV) launched a few years ago. RMI was launched on October 25, 2018 and has nicely outperformed the benchmark on NAV but lagged a bit on price. The NAV is up 6.02% so far this year- basically because it was launched at the best possible time when discounts on muni CEFs were very wide. But that driver is likely done for now as discounts are now tighter than average. In other words, do not expect that performance to continue. That said, it doesn't mean you have to run out and sell it. The Fund’s Managed Assets are allocated among two principal strategies: Tactical Municipal Closed-End Fund CEF Strategy (managed by RiverNorth) and Municipal Bond Income Strategy (managed by MacKay Shields). RiverNorth determines which portion of the Fund’s assets is allocated to each strategy and may,from time to time, adjust the allocations. The Fund may allocate between 25% to 50% of its Managed Assets to the Tactical Municipal CEF Strategy and 50% to 75% of its Managed Assets to the Municipal Bond Income Strategy. The Tactical Municipal CEF Strategy typically invests in municipal CEFs and exchange-traded funds seeking to derive value from the discount and premium spreads associated with CEFs. The Municipal Bond Income Strategy primarily invests in municipal debt securities of any credit quality, including securities that are rated below investment grade. RMI still appears to be cheap (and actually getting cheaper) at the current discount rate. Not to mention carrying a nice juicy distribution yield. The other benefit is the diversity and flexibility of the fund of funds platform giving them the ability to shift back and forth as conditions dictate. The start date of the fund was nearly perfect IPOing when muni CEFs had been clobbered by the belief that rates would be heading much higher. It should prove to drive sustainable dividends and capital gains. It is the ONLY muni CEF (counting National, State and High Yield) where the NAV total return YTD (+6.9%) is higher than the share price total return YTD (+3.1%). Nobody knows about it yet. So my point of view is they timed the IPO perfectly and I trust they’ll have no trouble meeting the monthly managed distributions from income, supplemented by capital gains if necessary. Best of all they are allowing us to buy into their success for about 94 cents on the dollar.The only downsides I see: it averages a measly 16,000 shares traded daily. Also, the size of the fund could force them to do another rights offering, similar to what they did with RIV. Remember why you invest in munis CEFs- to generate steady streams of tax-free income and compound it year after year. The non-quantitative benefit of muni CEFs are that natural downside hedge they can offer, especially on the high quality funds (non-high yield). The goal for a fund like Nuveen High Income (NMZ), which was a top pick in January because of the combined strong yield/fundamentals along with the cheap valuation (convergence trade opportunity) is to hold until its no longer the same strong fund. We want to buy a fund that is cheap and also strong fundamentally locking in a high yield on cost and margin of safety. Jumping out after a quick 8-10% gain like we've seen cuts off that income stream, especially when there is no place to allocate that capital. Let's look at MMD for example. It IPO'd at $20 per share (NAV close to $19) and today trades very close to that level. This is arguably the best muni CEF fund and it has not seen a single cent of price appreciation since launching. Instead, if you simply held throughout the roller coaster, ignoring the valuation changes, you either made 6.5% tax-free annualized (reinvested distributions) or 5% tax-free annualized (without reinvesting) for the last 6 and a half years. Either of those outcomes is far superior to making a quick (and taxable as ordinary income in most cases) short-term taxable gain of 9%. And then you have reinvestment risk as you have to find another place to park that money- likely in an inferior fund. Just because a bond CEF is traded like a stock, doesn't mean bond CEFs should be viewed as stocks. The view is that there is no limit to price growth. For example, what's the theoretical ceiling for Apple's stock price? Infinity, right? But for a bond fund, no matter how expensive a bond gets short-term, it will still mature at par. One more comment. We may have to lower our yield expectations just a bit. The 5% distribution yield threshold is going to be hard to maintain as the discount evaporate. 4.8%-4.9% may be the new area that will be common as funds prices approach NAV. Most funds yielding over 5% are unlikely to be able to sustain them long-term (for now, we've selected the best). Others may be good short-term convergence trades but that's about it.